Even if you brush and floss your teeth religiously, you still need to come see us here at Ridgepointe Dental at least twice a year for a checkup and cleaning. Because your teeth and mouth have many hard to reach surfaces your toothbrush and floss simply aren’t able to clean. Over time, they gather plaque and food particles that can eventually cause tooth decay and gum disease. 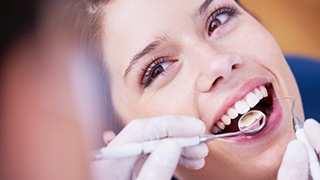 When you come in to see us for a standard checkup and cleaning, one of our hygienists will use special instruments to clean your mouth, focusing on these problem areas to make sure your smile is both clean and protected. Then, your dentist will perform an oral exam where he’ll look for the signs of common dental problems such as tooth decay, gum disease, and more. Coming in for a routine exam every 6 months will enable your dentist to catch any issues you might have before they can cause any real damage to your smile. This will help you preserve your teeth over the course of your life. How long has it been since your last checkup and cleaning? If you’re reading this page, it’s probably time for an appointment, so call us today!